Cooling and heating costs an arm and a leg. But the conventional wisdom simply doesn't apply to climate control technology like Zoned Comfort Solutions™. You don’t need to be told that energy doesn’t come cheap. With the arrival of each utility bill, you get another reminder. But here’s something you may not know: In the average home, cooling and heating can account for more than half of the total energy consumption. That means, if you’re shelling out a small fortune from one month to the next, your cooling and heating system(s) may be at least partly to blame. The good news? While traditional systems reinforced the perception that comfort and savings are mutually exclusive, the latest cooling and heating technologies suggest a new way forward by excelling precisely where older, outmoded systems often fall short. For climate control that pairs top performance with low costs, more and more homeowners are choosing comfort-creating, energy-saving Zoned Comfort Solutions™ from Mitsubishi Electric. 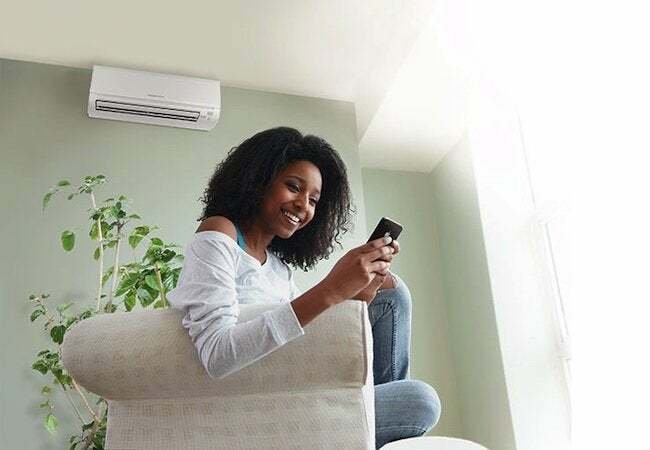 Featuring a powerful combination of ultra-efficient operation with control and customization, the Mitsubishi Electric system inspires you to reevaluate everything you took for granted about indoor climate control. Zoned Comfort Solutions take a fresh approach to climate control that impacts the design of the system and its basic mode of operation. To understand what makes the Mitsubishi Electric system unique, consider that a traditional forced-air system operates cyclically, in a stop-and-start pattern that devours electricity, drives up bills and leads to dramatic ups and downs in the indoor temperature. 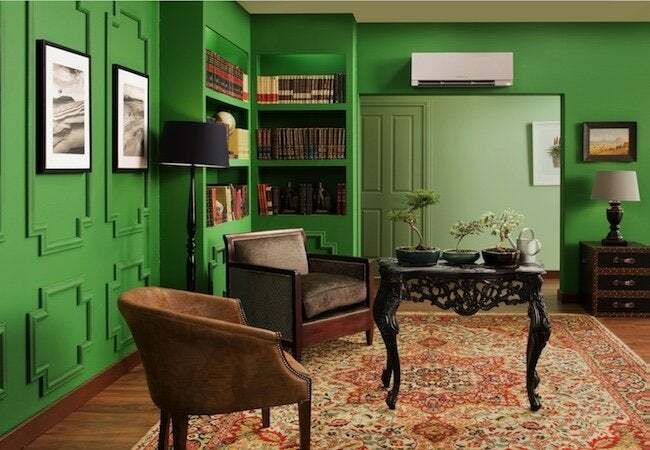 By contrast, Zoned Comfort Solutions slash energy use—enough to save you up to 40 percent on cooling and heating—by not operating cyclically, but continuously at a lower rate. Of course, efficiency doesn’t mean much if you’re left sweating or shivering, so Zoned Comfort Solutions work to ensure a steady, uniform home environment. With multiple indoor units installed within the home to distribute conditioned air and monitor temperatures, the system automatically adjusts its output to match the cooling or heating demand at any given time. The result? You always get the temperature you set on the thermostat. Other systems put homeowners in the position of having to sacrifice savings for comfort, or vice versa. Zoned Comfort Solutions stand out, because they require no sacrifice—finally, you can enjoy comfort and savings at the same time. Beyond its baseline efficiency, Zoned Comfort Solutions also enable you to seize countless opportunities to save. The key: Unlike a traditional system with one thermostat to control the temperature of the entire house, Mitsubishi Electric provides custom-tailored climate control, thanks to its zoning capability. 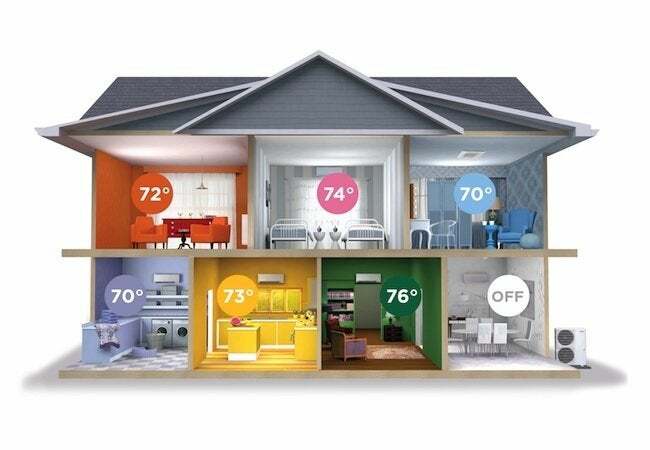 In a whole-home system, homeowners can establish a set of distinct zones, each one independently controlled with its own thermostat. 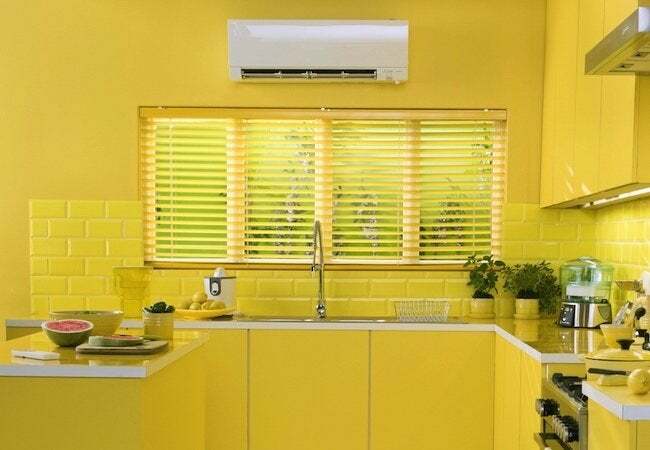 Now, if you want to cool or heat one room, you no longer need to pay for the energy consumed to cool or heat all the rooms—even the unoccupied ones. Instead, you can save energy—and enhance comfort simultaneously—by targeting temperatures on a zone-by-zone basis. For example, daytime activity centers on the ground floor, you can cut back on (or even turn off) climate control in the zone or zones upstairs. The added benefit: Only a zoned system accommodates for the fact that different people prefer different temperatures. 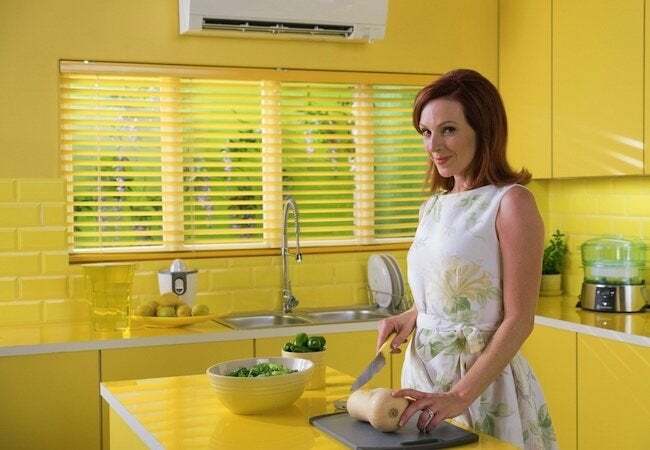 Your spouse likes it cooler? Adjust the temperature accordingly in the zone where he or she spends the most time. By sidestepping the wasteful, all-or-nothing approach of traditional systems, Zoned Comfort Solutions present a win-win for your bottom line and the comfort of your family. With its kumo cloud™ app, Mitsubishi Electric extends the already high degree of control it puts in your hands. Available for any iOS, Android or Fire OS smartphone or tablet, kumo cloud allows you to control your system from anywhere, at any time. (There’s even a web browser version, great for laptops or desktops). With virtually no barriers to system access, you never miss a chance to conserve. For example: On your commute to work one morning, you wonder whether you left the air conditioning on. With only a few taps or clicks, you can check the system status and make adjustments, potentially saving a day’s worth of wasted energy and expense. It’s true that most of the time, you can save by configuring your system to run on its own, in keeping with a pre-set schedule. But the unavoidable fact is that life doesn’t always follow a routine. Headed home earlier than you expected on a cold winter night? Use the kumo cloud app to ensure that upon arrival, your home welcomes you with cozy warmth. If anything, the innovative app testifies to the fact that cooling and heating isn’t what it used to be—and that’s a good thing! There’s one final way in which a Mitsubishi Electric cooling and heating system breaks from tradition. Though we’re used to thinking of cooling and heating as being separate, the savings achieved with integrating Zoned Comfort Solutions continues year-round, because the streamlined system delivers comfort in both the warm and cold seasons. In summer, it takes heat from the home and expels it outdoors, while in winter, the operation reverses and the heat from compression is used to warm the air indoors. Impressively, with an advanced Hyper-Heat® technology, the Mitsubishi Electric system manages to accomplish the latter even at temperatures as low as -13 degrees Fahrenheit. But most impressive of all is that Zoned Comfort Solutions deliver on their simple promise—performance of the utmost efficiency with no compromise of comfort. If you’re tired of hit-and-miss cooling and heating that costs more per month than it sometimes seems worth, you’re not alone. But whereas alternatives were few and far between in years past, we’re now living in the 21st century. There’s no reason to continue tolerating lackluster performance and unnecessarily high costs. Embrace change and upgrade to versatile, cost-effective, endlessly customizable Zoned Comfort Solutions—get started now!